" ... [Attorney William] Pepper said he has new evidence and wants to reopen Sirhan's case. ... "
LOS ANGELES — An attorney for the man who assassinated Robert F. Kennedy said Monday his client was transferred from a prison that houses high-risk offenders to a new facility where his life could be in danger. Attorney William F. Pepper said Sirhan Sirhan opposed the move from the California state prison in Corcoran, which houses high-risk prisoners such as Charles Manson, to Pleasant Valley State Prison in Coalinga. "Our main concern is for his safety," said Laurie Dusek, an associate of Pepper. "We are not sure that Pleasant Valley has the ability to protect him. He is a target." Oscar Hidalgo, a spokesman for the Department of Corrections and Rehabilitation, said Sirhan, 65, had requested the transfer and wants to stay in Pleasant Valley. "After discussing his hesitation with prison officials at Pleasant Valley, Sirhan Sirhan indicated he wanted to stay at the new facility after all," Hidalgo said. "He can indicate if he feels unsafe at any point and the department will respond appropriately." Sirhan is serving a life sentence for the 1968 killing of Kennedy. He had been housed for years in the protective housing unit at Corcoran, one of the most isolated units in the state prison system. Pepper said neither he nor Sirhan had requested the move and neither had received notice until Sirhan was actually moved Thursday. Hidalgo countered in a written statement that the move followed numerous requests by Sirhan to be transferred from Corcoran. "His movements there have been extremely controlled and his exposure to others extremely limited," Hidalgo said. At Pleasant Valley, Sirhan will be housed in a cell by himself. He will interact with a larger group of inmates in a larger yard but will not be mingling with the general population, Hidalgo said. He said Sirhan's lawyers were notified of the move. Dusek said she had contacted prison officials, checking on a report from Sirhan's brother that he might be moved. Authorities denied any knowledge of such a change, she said. Pepper said he wrote to Gov. Arnold Schwarzenegger protesting the transfer. The governor's office said it had not received any communication on the matter. Munir Sirhan confirmed he had notified the lawyer about the transfer and said his brother had asked to be moved at one point but not to Pleasant Valley. 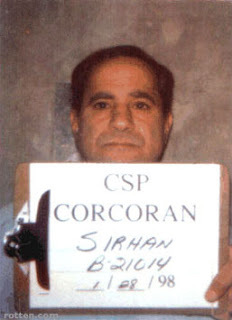 Sirhan Sirhan did not feel safe at Corcoran after he was singled out following the Sept. 11 attacks by guards who thought he was a Muslim, even though he is a Christian, his brother said. Branded a potential terrorist, Sirhan was placed in total isolation where he remained for six years before being returned to the protected housing unit, Munir Sirhan and Dusek said. Hidalgo said Sirhan was placed in an isolation unit on July 12, 2002 for threatening staff. He refused to leave the unit to return to protective housing but repeatedly sought transfer to a "sensitive needs yard" with less restrictions. He remained in the isolation unit for six years, Hidalgo said. On Oct. 15, a review board determined Sirhan no longer required exceptional placement, a decision that led to his transfer, Hidalgo said. Pepper said he has new evidence and wants to reopen Sirhan's case. He took up Sirhan's cause after lawyer Lawrence Teeter died in 2005. Teeter claimed ballistics and other evidence proved the killing was part of a conspiracy. Pepper said he has hired a psychologist to try to help Sirhan retrieve memories of the night that Kennedy was shot. Sirhan has claimed he remembers nothing. Pepper also represented Martin Luther King assassin James Earl Ray in the last years of his life. He attempted to prove that Ray was not the lone assassin who shot King, and that the civil rights leader's death was part of a conspiracy.